Mahmoud Bazzi is accused of killing two Irish soldiers in Lebanon. Mahmoud Bazzi, pictured here on the right. AN IRISH SOLDIER has spoken about coming face to face with the man accused of killing two of his friends and shooting him. In a special report on tonight’s RTÉ Prime Time, reporter Barry Cummins travelled to Lebanon to follow a former Irish soldier as he came face-to-face after 35 years with a man charged with attempting to murder him and with murdering two other Irish soldiers. In April 1980, Private John O’Mahony was shot in the stomach after he and his colleagues Privates Derek Smallhorne and Thomas Barrett were abducted by members of the Israeli-backed DFF militia in southern Lebanon. Privates Smallhorne and Barrett were both later found shot dead. Both were married fathers of three young children. 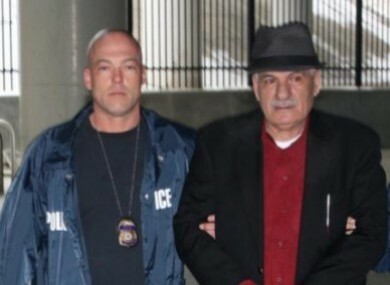 Mahmoud Bazzi, a 72-year-old Lebanese citizen, was extradited back to his own country from the United States earlier this year. He had been living there and working as an ice cream vendor since 1994. His trial began last week. O’Mahony travelled back to Lebanon last week to give evidence in the trial. O’Mahony was escorted during his entire time in Lebanon by a Close Protection Team from the Irish Army Ranger Wing. The trial was held amid tight security in a Military Court before a panel of seven judges. In an interview in Beirut with the RTÉ Prime Time team immediately after he gave evidence to the court, O’Mahony said it gave him great satisfaction to finally have his day in court. When I woke up this morning it was a bit emotional when I got up, and when I got into the courthouse it gave me great satisfaction to be able to stand up and point out the man that shot me in that year of 1980. It was very easy for me because the evidence was all embedded in my head. And it is embedded there for 35 years and thank God it never left me or I never forgot Bazzi. Bazzi is pleading not guilty to all charges, but O’Mahony claims he was involved. I never forgot his face, I never forgot his voice. Because when he became a bit agitated it brought me back to the day in 1980 when he rounded us up and took us out to shoot us. After O’Mahony was shot, his two colleagues were taken away in a car. Their bodies were found some hours later. They had been shot dead at point blank range. O’Mahony’s evidence to the court in Beirut was where he identified Mahmoud Bazzi as the man who held the three of them at gunpoint and who then opened fire, hitting him in the stomach. I hope today I have done my part in seeing that he will be brought to justice. Mahmoud Bazzi was remanded in further custody and the trial resumes in April. Comments on this article have been closed as legal proceedings are underway. Email “"It brought me back to the day in 1980 when he rounded us up and took us out to shoot us.””. Feedback on “"It brought me back to the day in 1980 when he rounded us up and took us out to shoot us.””.